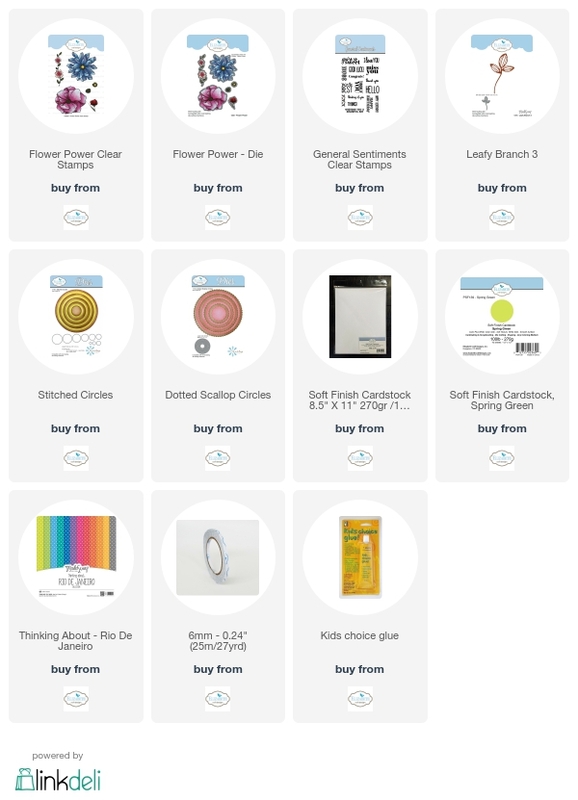 It's my turn to post a tutorial today for the Coloring Design Team on the Elizabeth Craft Designs blog. 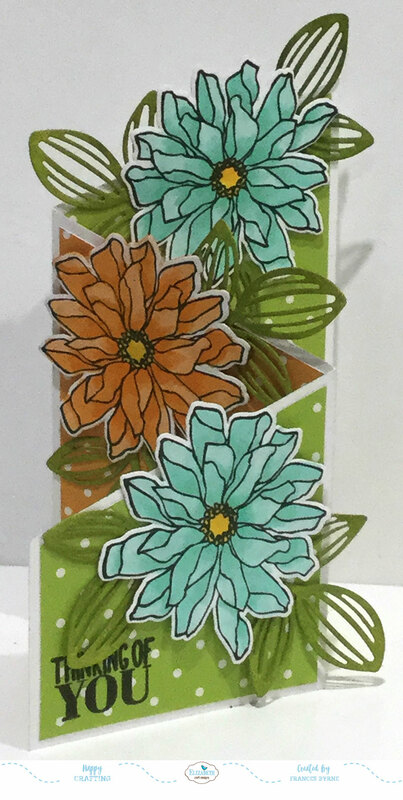 This time round I decided to create a trifold card using the Krista Schneider Flower Power Clear Stamp set and coordinating dies as well as the ModaScrap Leafy Branch 3. 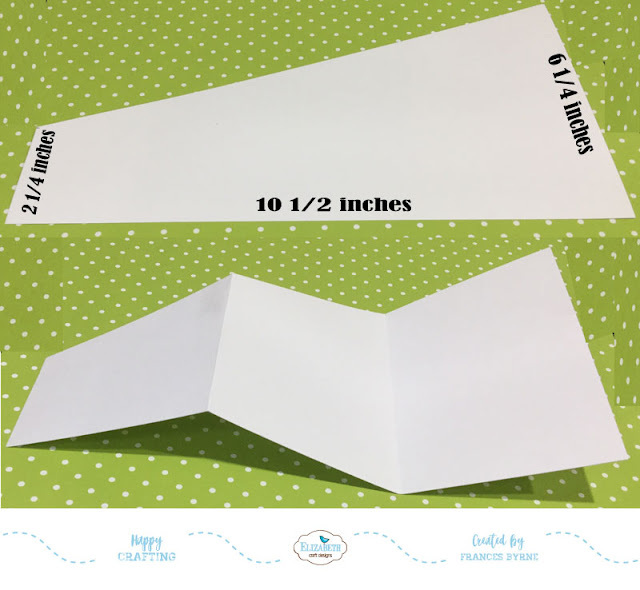 Cut a piece of White Soft Finish Cardstock so it measures 10 1/2 inches x 6 1/4 inches. 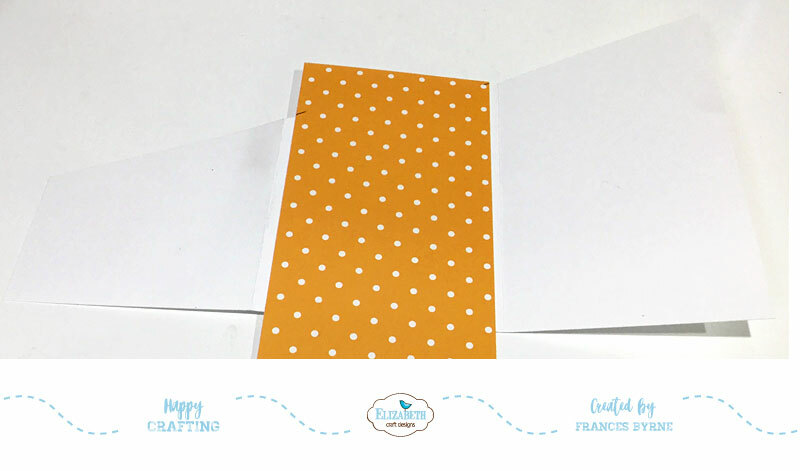 Measure along the left hand side and make a mark at 2 1/4 inches up from the bottom of the card. Use a paper trimmer and cut from the 2 1/4 inch mark up to the 6 1/4 inch side to create a diagonal top edge. Score along the long side of the card at 3 1/2 inches and 7 inches. Create a mountain and valley fold referring to photo above. 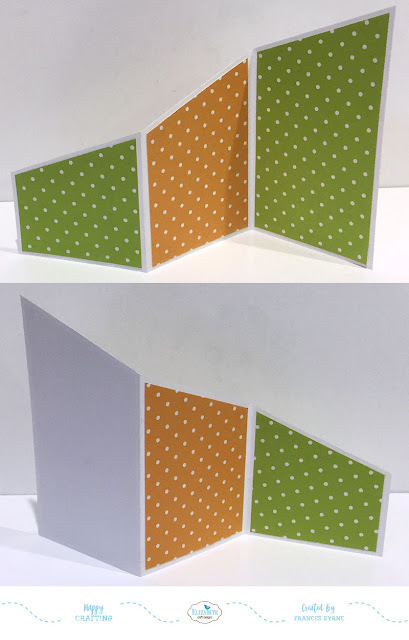 Cut a piece of yellow and green polka dot patterned paper from the ModaScrap Thinking About Rio de Janeiro 12 x 12 Patterned Paper Pack so that they measure 3 1/4 inches wide. 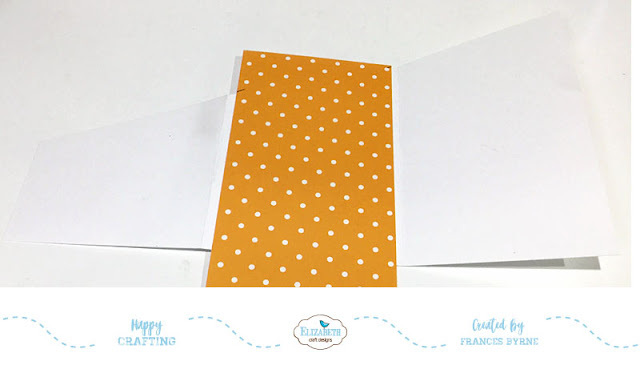 Place the patterned paper to the section that it will be placed on the card so that the top edge of the patterned paper is slightly over the edge of the card. Make a pencil mark on the top and bottom edges of the paper. Use paper trimmer to trim along these points. Making the bottom of the paper 1/4 inch shorter than the pencil mark at the bottom. Adhere all patterned paper panels to the card referring to photo above for placement. Using the flower from the Flower Power Clear Stamp set, stamp onto White Soft Finish Cardstock using black ink. Use coordinating die to die cut all flowers. Color the flowers using copic markers. Using the "Thinking of You" sentiment from the General Sentiments Clear Stamp set, stamp to the lower left hand corner of the front card panel using black ink. Adhere flowers to card using foam tape, referring to photo above for placement. Optional: As the orange flower will be seen when the recipient opens the card to read the sentiment in the centre panel. Die cut an additional flower using the coordinating die from White Soft Finish Cardstock and color the back of the flower the same color as you colored the centre flower. Adhere this piece to the flower before adhering the flower to the card. Using the ModaScrap Leafy Branch 3, die cut 6 sets of leaves from White Soft Finish Cardstock. Color leaves using Peel Paint and Twisted Citron Distress Inks. Using the "Good Luck" sentiment from the General Sentiments Clear Stamp set, stamp onto White Soft Finish Cardstock using black ink. Die cut around sentiment using a circle from the Stitched Circles die set. 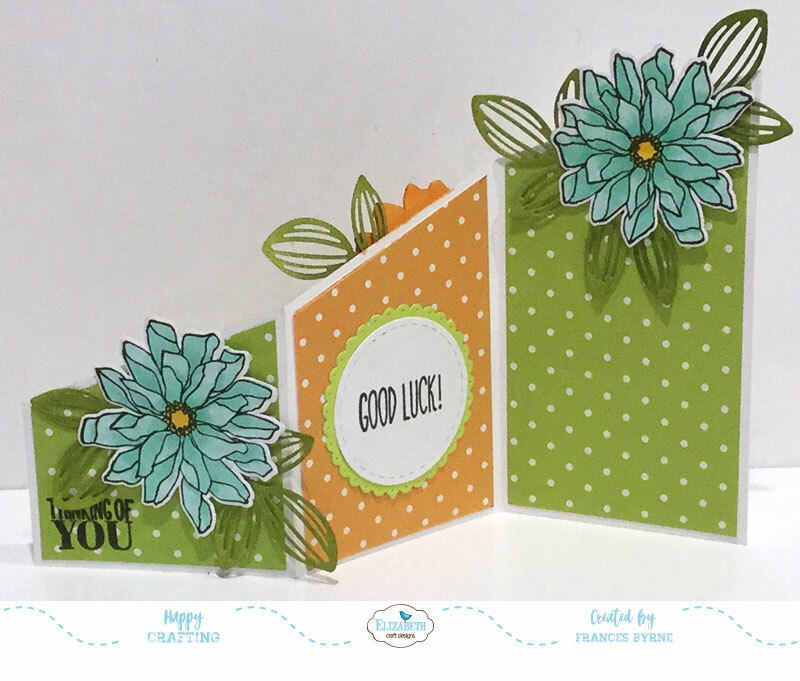 Using a circle from the Dotted Scallop Circles die set, die cut a circle from Spring Green Soft Finish Cardstock. Layer circles together and adhere to centre inside panel. 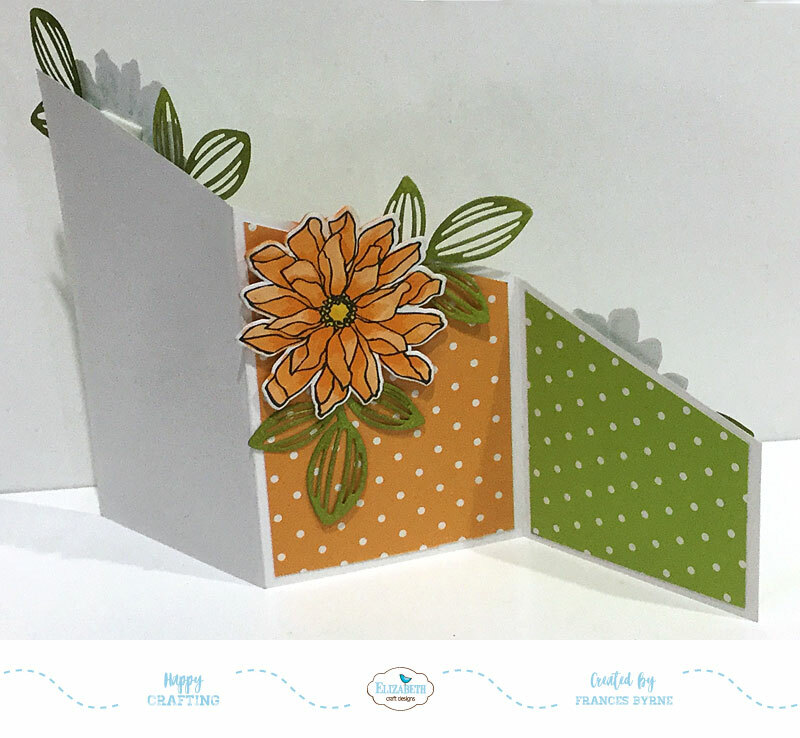 Pretty card - and great tutorial.